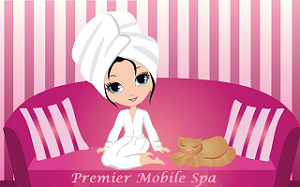 Premier Mobile Spa is a on-site, or traveling day spa in West Palm Beach, Florida. We provide luxury spa treatments, massage and beauty services at very affordable rates in the comfort of your home, condo or hotel room. We specialize in event entertainment and spa parties for all occasions! Our Spa services are very affordable and packages can be priced to include every budget! Perfect for bridal showers, baby showers, bachelorette parties, girls birthday parties, kids birthday party, teen parties, teenage pampering, proms/Grad Nights, corporate events and trade shows. May we assist you into tranquility with our sensory indulgent facial treatment experience. We will soothe, rejuvenate, and nourish your skin with incredible sensations and euphoric aromas. This indulgent treatment is perfect for people on the go. We begin with a shape and cuticle touch up then indulge your hands or feet in a bath of warm, melted paraffin wax to seal in moisture. Originating in ancient Egyptian culture, this pressure point massage works reflexes in the hands and/or feet which correspond to specific internal organs. It helps to re-establish the body's natural energy flow. Premier Mobile Spa offers luxurious personalize private spa parties at your home, hotel room or office. Call today and enjoy a our relaxing day spa at home with spa music and aromatherapy at no additional cost. Our team of professionals beauty and spa experts will cater to all aspect of your party or corporate event. Wellness program for corporate customers Employee Incentives, Team Award program, Employee Appreciation Day and more. We have the best rates and customizable corporate spa packages in West Palm Beach, Fl. Indulged yourself with our massage therapy day spa in your own private comfort zone. Wether you are on vacation or simply looking for a weekend day to relax and be pampered, Our team of licensed professionals and beauty experts will help you achieve the desired treatments and meet all your expectations. Benefit from Reduced stress, Relaxation, Release Tension, Pain relief and body aches. Enjoy togetherness, relaxation and rejuvenation with our Couples Massage, This package for two features the 60-minute Swedish couple’s massage in comfort of your own home. Relaxing spa ambiance music and aroma therapy will be provided by massage therapist. Massages are customized specifically for you at the time of your session. Whatever your preference, we can work together to create a massage that’s suited to your needs. Enjoy a full body table massage from a skilled therapist as he/she apply synchronized strokes gathered from a variety of bodywork techniques. Improved elimination of toxins and more. Spa near me, you ask? We are the nearest and definately the closest spa, Look no further. Why look for a spa near you when you can have it come to you! Let us provide the ultimate fairytale for your birthday princess and her friends. Our girls spa packages have been created to give you the ultimate party experience for your birthay girl. A fabulous party where girls will find beauty, creativity and entertainment. We offer makeover services, mini pedi and mini mani, light makeup and more. Fully personalized girls spa birthday parties. Call us and enjoy our mani and pedi service for your little girl. Let our Team of experts help relieve some of the stress that comes with party planning, So relax and enjoy your day! Show your clients or employees that you really do care with our Corporate spa services. Our Spa events are unique and out of the ordinary. Customers will enjoy having a choice of manicures, pedicures, chair massages and many more! You can customize a package for your customers and it'll make them feel special. Let me plan your party, event or get together and have a great time! Bachelorette, Baby Showers, Birthday parties, Wedding bridal shower, Special events, Corporate events party planner and cordinator. Give the gift of massage, facials, hair removal,pedicures, manicures & more that can be used at anytime and does not expire. Our beauty spa professionals deliver services on the go such as reflexology massage, facials, pedicures, manicures, table massage and chair massages. We specialize in providing all the luxury services you expect from a spa / salon without the inconvenience of leaving your home. Best hand and foot massage in South Florida. Please dont forget to recommend us to your friends and family. Premier Mobile Spa Parties 5 out of 5 based on 5 Ratings and 3 reviews.